There is another postcard on this website showing the inside of the Hotel Harms Tap Room. This postcard shows the exterior of the hotel that once stood at the northwest corner of 18th Street and First Avenue. It was built for – and named after – owner Lothar Harms. Mr. Harms was born in Germany and came to Rock Island for the first time in 1866. We have been fortunate to talk to descendants of both long-term owners of the Hotel Harms: Lothar’s granddaughter, Ruth Harms Mehuys of Moline, and Francis Coyle’s son, Rock Islander Francis “Frank” Coyle, Jr.
Harms intended his hotel to be a “landmark from the river” and he retained local architect Ferdinand S. Borgolte as its designer. Although only four stories were originally intended, the final height was five stories. At that time, servants quarters were on the fifth story, although nowadays it would surely be high rent penthouses. Construction began in 1901, under general contractor John Volk and masonry contractor C. J. Larkin. Lothar Harms planned for a modern hotel, one that would be surprisingly acceptable today. It was the first Rock Island hotel to operate on the European plan, where daily meals were not included in the room charge. As a result, it was reported that huge dining rooms and corridors were not required. The hotel had an elevator as well, framed in ornate iron grillwork and extending from the two-level basement to the fifth floor. Twenty-five of the sixty guestrooms were even equipped with private baths. Fine materials were used throughout. Public areas on the first story had floors of a mosaic tile and the stairs and wainscoting were of brown marble. The second floor, which contained several large rooms for private dining, was also beautifully decorated. On the upper stories, the floors were hardwood. Halls had velvet carpeting (a high density low pile, much like today’s commercial carpet) and the guestrooms had area rugs. Woodwork throughout was oak or walnut. An early promotional flyer called it the first hotel in Rock Island to have telephones. The two lower stories featured frescoed ceilings and wall panels embellished with scenes hand painted by Moline artist Frank Lundahl. Lundahl, who advertised himself as a decorator, was born in Rock Island in 1858. He studied at the Art Institute in Chicago and worked in oils, watercolors, and graphite. A huge painting of a blacksmith at work that was done for the John Deere Company now hangs in Augustana’s Wallenberg Hall. At his death in 1932, it was reported that his murals included those in Davenport’s Capitol Theatre, the Huntoon House, and the First Lutheran Church, both in Moline as well as some for “a Chicago jeweler.” Many paintings were left in his home at 1140 12th Avenue, Moline, to be disposed of at the discretion of his son. The Hotel Harms frescoes were painted over in the interval between the Harms and Coyle family ownership. This postcard, dating from about 1910, shows the beautifully proportioned five-story hotel, with arched openings on its high first floor that are reminiscent of the sheltered arcades seen in some European walled cities. The rhythmic arches continue at the top of the fourth floor, defining columns of wide windows. The main entrance, recessed and centered on the 18th street side, is sheltered by a deep marquee. Above is a balcony that was adjacent to the private ladies’ dining room. The lobby area, which was a few steps above grade level, held the elevator and the grand staircase. To the north were the barroom and a restaurant “grille room,” the subject of another postcard article. A barbershop and a beauty parlor were in the southeast corner, accessible from the street as well, while the kitchen was at the southwest corner. We learned more history about the hotel during the ownership of the Coyle and Harms families. Mrs. Mehuys’ father, Charles Harms, was called home from college around 1920 to operate the hotel when his father, Lothar’s, health was failing. Although many other local saloons went underground and operated as speakeasies during the prohibition years of the 1920s, Charles refused to break the law and would not sell liquor at the Tap Room. The loss of profits from the bar may have contributed to the Harms family losing the hotel to foreclosure in 1929. Francis Coyle put his unique stamp on the hotel when he became the owner in the early 1930s. In those years, it was primarily a transient hotel and the nearby railroad stations provided many travelers. Mr. Coyle, whose brother Elmer was the manager, insisted on an integrated hotel, unlike most other local hostelries. He had played college football with blacks and respected them. The Pullman porters union, an overwhelmingly black organization, even maintained rooms at the Harms for overlaying porters. Frank Coyle also told us that the hotel was a viable business up to the time of its destructive fire in 1974. Although the clientele had changed from mostly transient to mostly residential, its spacious rooms and suites, some of which were two-bedroom apartments, were still occupied on a regular basis. 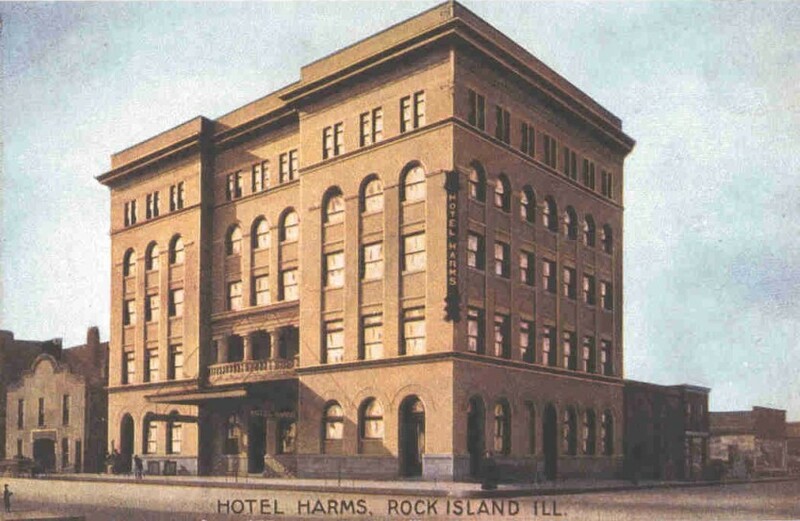 We learned another thing about the Harms Hotel: It was one of the best-loved buildings in Rock Island, by the families of both primary owners, the Harms and the Coyles, and by seemingly everyone who ever entered it. The only regret is that it is no longer here for new generations to experience the vision of Lothar Harms. Auf Wiedersehen, Hotel Harms, and Danke Schon for the treasured memories. This article, by Diane Oestreich, is slightly modified from the original, which appeared in the Rock Island Argus and Moline Dispatch on February 16, 2003.